The UCON BT is a compact Overhead Console that features a powerful internal Bluetooth / D-Class Amplifier and full size 6.5" Kicker speakers! We designed this unit for those who use their cell phones for their music source, so there are no other distractions involved. All you have to do is pair your phone with the internal amp and you are ready to rock! The console is our "Universal Design" and we have mount kits available for most every Side-By-Side manufacture, and it can also be roof mounted to most any flat metal or plastic roof as well. The mounting kits allow this unit to be mounted to the specific factory roll cages and can be used with machines with or without a roof. The tiny footprint makes it the perfect console for most any size cage. What really separates this console for any others like it is the ability to securely hold two cell phones by means of two cavities that will hold phones with or without external protective cases. This my friends is just too cool! There are rubber pads on both top and bottom (tension arms) so your phone is "squeezed" in place but will not scratch it or the screen. We also installed a charging jack so you can keep your phones and music coming for as long as you ride. 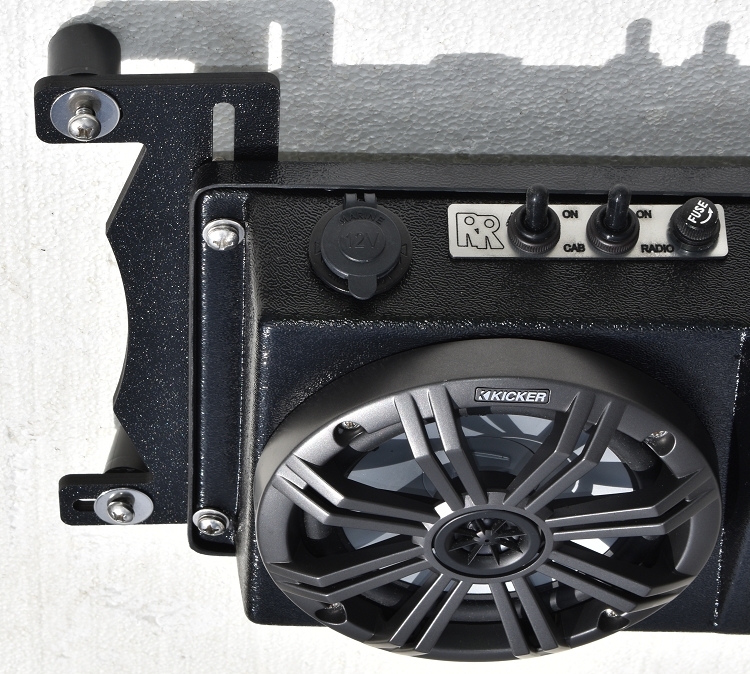 Due to the nature of the "High Powered" internal amplifier we are only offering the UCON BT assembled with 6.5" Kicker speakers. It makes no sense to have plenty of power and than restrict it by the speakers.